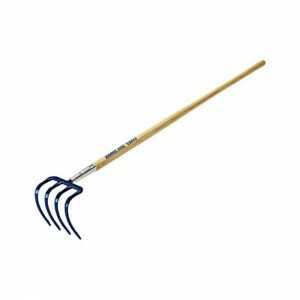 4 Tine Heavy Potato Hook has a tough, 54″ long seal-coated North American ash handle for strength and durability. It has a forged head, chrome steel ferrule for extra strength. 7″ 8 1/2″ L head and 4 heavy duty steel tines. This tool is sturdy enough for agricultral and commercial use. Its tines are sturdy and ideal for digging or harvesting potatoes and similar types of vegetables. It can also be used to transfer manure and loose material or even for general garden clean-up. This is a great addition to any tool collection and worth the investment. Metropolitan Wholesale is New Jersey and the New York Tri-State areas one stop source for 4 Tine Heavy Potato Hook and all things garden related at wholesale prices. We carry a full selection of wholesale statuary, fountains, tools, cut flowers, planters and pottery, tropical plants, annuals, perennials, seeds and much more.